Water is life and in a disaster, or emergency situation, being able to call on a safe and reliable means of hydration becomes a priority for survival. In this guide we’ll take a look at the very best emergency and survival water filters and purification systems to ensure that if disaster strikes, your access to clean drinking water is never under threat. The best survival water filters have one very simple yet imperative job to do – to ensure that you have access to sufficient drinking water at all times and that this water is clean, safe, and free from any contaminants that would otherwise cause a risk to your health. While the human body can go on for several days without food, water is another matter entirely, with the onset of dehydration coming on rapidly and ultimately proving deadly. Whatever the emergency or situation that you may find yourself in therefore, the fact of the matter is that you will always need to have access to a reliable and safe source of drinking water to ensure your survival and it’s here that the best survival water filters step in. A comprehensive survival water filter system will allow you to take water directly from a wide variety of sources ranging from the faucet through to water acquired from the rain, wells, rivers, streams, and even lakes, before filtering out harmful contaminants such as bacteria, viruses and waterborne protozoa and making it drinkable. Whether you find yourself bugging out to find safety away from your home or are planning to seek shelter indoors with a home preparedness strategy, the risks to your water security are equally real and each require an equal level of careful consideration when ensuring you have access to a reliable, safe, and consistent source of hydration at all times during an emergency situation. The good news is that there’s an excellent variety of survival water filters and emergency water filtration solutions out there which will allow you to take care of your purification priorities whether you’re prepping a solution for drinking from a stream in the wilderness, or are looking to guarantee the safety and quality of your water closer to home. There’s a lot of choice out there and we’ve covered the main contenders, scrutinizing their details to the micron to bring you our pick of the best survival water filters to help you find the right system for your specific needs. Finding the best survival water filter for your situation involves thinking about a number of factors from the degree of filtration or purification required, through to the number of people and the length of time it needs to cover. From portable water filters to home water filtration systems, we’ve evaluated the best survival water systems for every eventuality to help you make an informed decision when it comes to building a hydration and water purification contingency into your preparedness planning. When thinking about survival water filters for home preparedness, the major benefit you’ll have right off the bat is the benefit of space and not being constrained by the size and weight factors that play such a critical role when planning to evacuate or bug out on foot or in a vehicle. With this in mind, the best home survival water filters can afford to be larger and heavier and as a result are often more sophisticated than their more compact alternatives. In practice what this means, is you’re going to be able to go for a water filtering system that works in much the same way as your current method for obtaining water, allowing you to get water straight from tap or spigot to glass, minimizing the disruption to what your used to in everyday life. The best survival water filters for the home are in fact so good, that many people actually utilize them as an everyday water filtering system anyway due to the high quality and overall superiority of the the filtered variant over straight tap water. This is an excellent habit to get into if you’re thinking of investing in a home emergency water filter as not only will you realize a return on your investment almost immediately, but you’ll also be completely familiar with the operation of your water filter in the event of an emergency situation, meaning if the usual sources of water run dry, it will be business as usual when it comes to replacing your supply with an alternative and running through your survival water filter. Probably one of the most versatile home survival water filter systems out there, the Big Berkey is arguably the brand’s best known water filtration systems with a well deserved reputation for both reliability and quality. 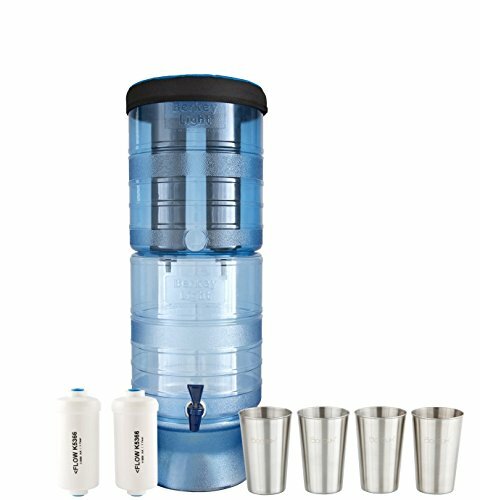 The Big Berkey holds around 2.25 gallons of filtered water and is an excellent choice if you’re looking for a home survival water filter system that will serve you equally as faithfully in good times as well as bad. 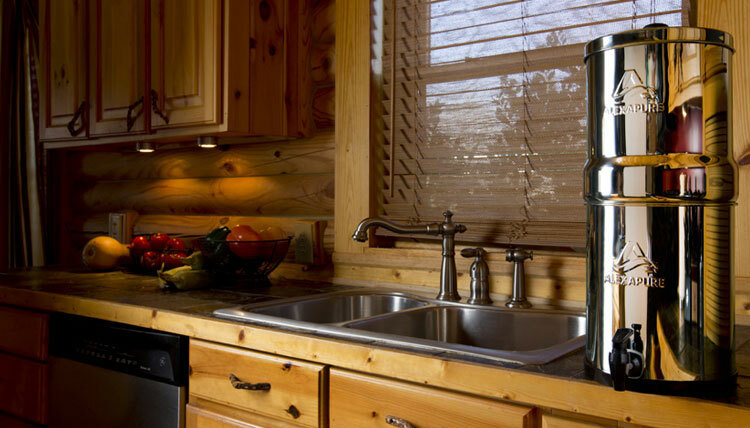 If you’re putting together a home preparedness plan for a small-medium sized family, the Big Berkey makes an excellent survival water filter for purifying up to 15 gallons of water per day. As with other water filters within the Berkey range, the Big Berkey removes pathogens and reduces harmful chemicals without actually removing the minerals in water that are beneficial to health. If you’re looking for the best entry-level survival water filter that offers a wide range of versatility and the ability to transition from business as usual to survival mode without skipping a beat, then the Big Berkey filtration system represents an excellent all-rounder combining an impressive flow rate and filtering ability with a durable design suited to the everyday and the not-so-everyday situations in life. The Alexapure Pro is a home emergency water filter system with a 2.25 gallon (8.5 liter) capacity for treating, storing, and dispensing water. When you add raw water to the Alexapure Pro, the filtration elements inside the system are capable of removing up to 99.9999% of over 200 kinds of water impurity including viruses and bacteria, cysts, chlorine, flouride, E. coli, and TCP. Operation of the Alexapure Pro is incredibly simple and just what you’d expect from a leading home survival water filter. Simply pour a source of unfiltered, ‘raw’ water into the system, and once it’s filtered, use the spigot to pour perfectly purified and clean drinking water. As with many of the best home survival water filters in this guide, the Alexapure Pro’s filtering flow rate and filtration capacity can be increased by adding extra filters to the system (up to a maximum of 4 filters in total). 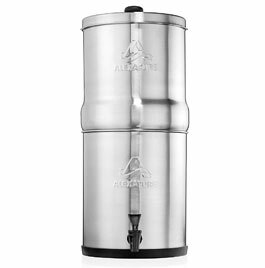 The Alexapure Pro provides the essential features you should ideally be looking for from a survival water filter for home use, pairing a durable stainless steel construction with a high performance gravity powered filtration system, impressive flow rate, and high storage capacity. The first thing that you’ll notice about the Berkey Light is that unlike many of the other home emergency and survival water filters in this list, it utilizes a plastic (BPA free of course) rather than stainless steel construction. What this means right off the bat of course, is as the name suggests, the Berkey Light is both weight conscious, while still remaining durable enough for almost any usage scenario. Weighing in at around 5 lbs when empty and offering a capacity of around 10.5 gallons, the Berkey Light provides enough carrying flexibility for transporting in a vehicle if needed while a transparent design also allows you to see exactly how much water is left in the canister before you need to refill. As with other water filter systems in the Berkey family, the Berkey Light’s default configuration includes two Black Berkey filter elements which offer a combined lifespan of up to 6000 gallons. This counter-top water filter is a good choice if you’re looking to provide enough water for around 5 people while offering the ability to extend far beyond this and cater for larger groups in an emergency situation. If you’re looking for one of the best home emergency water filters that’s also well suited for vehicle travel and remote use when needed, then the 3 gallon Royal Berkey is an excellent choice. 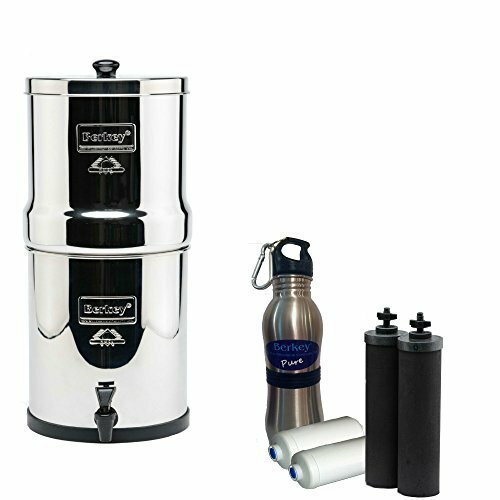 Constructed from high grade 304 stainless steel, the Royal Berkey is ideal for use as either a survival water filter during unexpected emergencies or as an everyday filtration system for use at home. The Royal Berkey is able to purify both treated and untreated water meaning that you can pull raw water direct from sources such as ponds, streams, and lakes and the system will purify it for drinking. 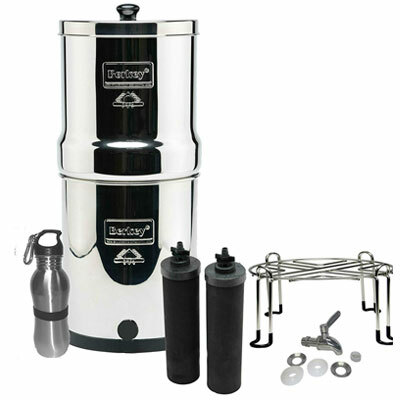 With the ability to remove impurities such as pathogenic bacteria, cysts and parasites entirely from water, the Royal Berkey makes an excellent survival water filter and is also capable of extracting chemicals including herbicides, pesticides, VOCs, organic solvents, radon 222 and trihalomethanes as well as reducing nitrates, nitrites, lead, and mercury. The Royal Berkey water filter is perfect for use both within a home preparedness strategy as well as for use outdoors, particularly in situations where electricity, water pressure or treated water are questionable or simply unavailable. Purifies up to 4 gallons per hour with ability to extend to 8 GPH with additional filters. The Crown Berkey is a home water filter system designed to cater for larger families and groups making it perfect for use in an emergency situation both at home or for community group coverage. 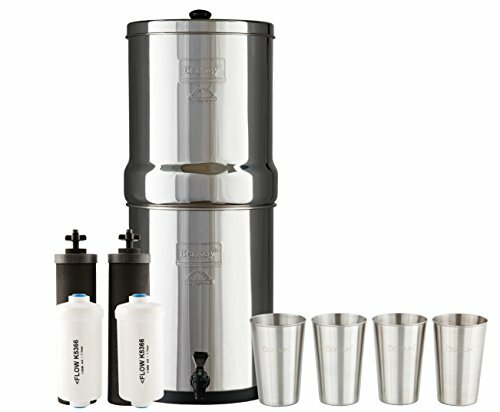 As with the other systems in the Berkey range, the Crown Berkey makes an excellent survival water filter given its ability to remove harmful elements from raw water as well as from treated water meaning it’s going to be just as comfortable purifying water from stagnant outdoor water sources as it is when dealing with water from the tap. The default configuration for this water filter is to operate with 2 ‘Black Berkey’ filtration elements, although this is expandable up to 8 elements to increase the purification flow rate and subsequently, to offer coverage for a larger group of people in an emergency. With each of these filters capable of filtering around 3000 gallons of water (6000 total with the dual configuration), you’re looking at an extremely long lasting survival water filter solution. Whether it’s the removal of pathogens and parasites or simply purifying your everyday drinking water, the Crown Berkey is well suited as a hybrid everyday us and survival water filter for filtering at home by larger families over a prolonged period of time. If you’re looking for a water purifier that doubles up as the ideal filter for use in a camp or at home as part of your preparedness planning, then the Community High-Volume Water Purifier is the perfect choice. A great option if you’re prepping for a family or large group, this durable water purifier is able to deliver up to 12 liters of clean water an hour. 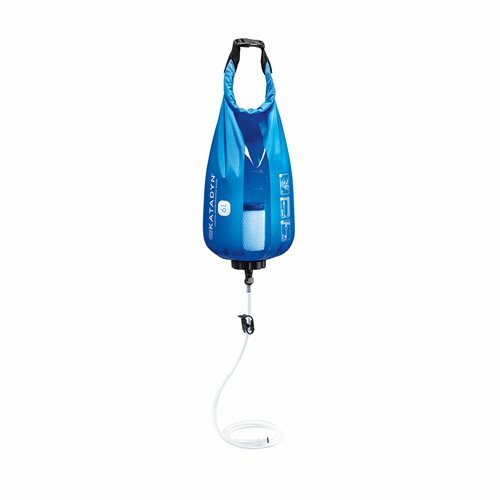 Unlike the traditional LifeStraw system which filters through suction, the Community High-Volume Water Purifier is gravity fed meaning you can let it get on with the job of cleaning any water source while you take care of other tasks. Effective against protozoa, bacteria, and viruses. Uses hollow fiber filtration technology to convert contaminated water into clean and safe drinking water. If you’re setting up camp either solo or as a group, a gravity fed survival water filter represents an excellent choice for high quality water purification that packs flat, weighs virtually nothing, and is easy to carry. 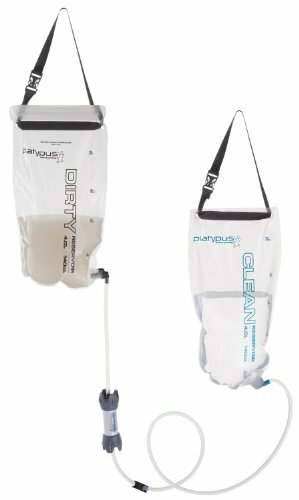 The premise of gravity fed water filters couldn’t be simpler, effectively just a bag that you fill with water and hang from a branch, wall, or equivalent spot, before allowing gravity to do the work of purifying a questionable water source. Whereas other survival water systems designed for portability depend on either suction (in the case of ‘tube’ style filter straws, bottle filters, or bladder solutions) or some form of hand pump to pass water through a filtration element, gravity fed survival water filters operate in the same way as large home emergency filters such as the Berkey range, where the water is ‘pulled’ through the filter by gravity, leaving you with a clean and drinkable end-result at ground level. The fact that this kind of survival water filter is able to fold down to a negligible size when not in use means that it’s also a great solution if packing space is at a premium or as a low-profile solution for storing with your emergency preparedness supplies at home. 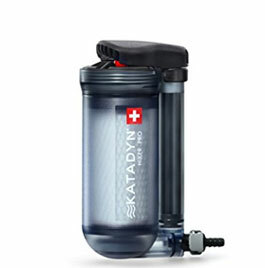 The Katadyn Gravity Camp is a 6 liter/1.58 gallon gravity fed water filter that utilizes a 0.2 micron filter offering a flow rate of up to 2 liters (around 0.5 gallons) per minute. Providing up to 15000 liters/396 gallons of safe and clean drinking water, the Gravity Camp protects against dangerous impurities ranging from bacteria and protozoan cysts through to sediment. 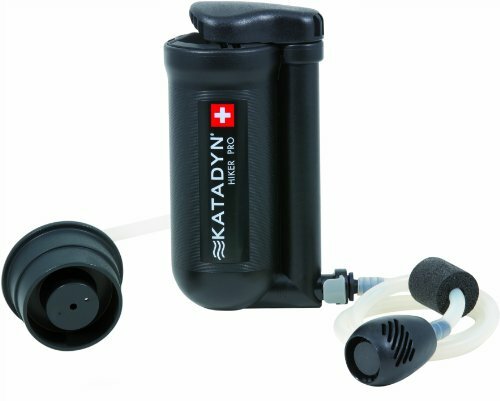 The benefit of portable gravity fed water filters is that they pack down flat and can be hung from a high spot, pretty much wherever you find yourself and in this respect, the Katadyn is no different, weighing in at an impressive 11 oz. 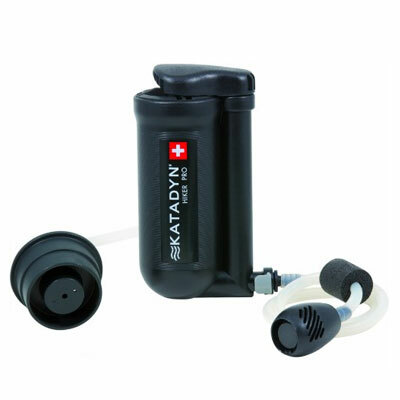 As with all survival equipment, the best emergency water filters need to be versatile as well as durable and reliable and the Katadyn is compatible with hydration bladders as well as offering the ability to convert to a camp shower with the addition of an adaptor. A great addition to a comprehensive bug out bag or vehicle packing list as well as a versatile and low profile backup in your home preparedness supplies, the Katadyn Gravity Camp is a dependable survival water if you need a solution that can be carried easily and setup quickly. This gravity-fed water filter system features two 4 liter Platypus water reservoirs, one for unpurified raw water and one for filtered and clean drinking water. Filling the first hydration bag (usefully labeled ‘Dirty’) with water from a source like a river or stream before hanging above the second reservoir (marked ‘Clean’) will allow you to filter up to 4 liters of water through a connecting tube and filter system, leaving with you reservoir full of clean and safe drinking water. As soon as you’ve collected your water and hung the filled reservoir from a tree branch or similar raised area, 1.75 liters of filtering per minute means you’re looking at around 2 and a half minutes until you’ve got a full reservoir of clean water ready for drinking, cooking, or washing. The reservoirs themselves are antimicrobial and BPA free and the design of the system is optimized to reduce any taste once the water is filtered. A hollow fiber microfilter is responsible for cleansing the water that you collect and is capable of removing 99.9999% of bacteria and 99.9% of protozoa, including giardia, cryptosporidium, E. coli, salmonella, cholera, the Platypus GravityWorks meets all EPA guidelines. When it’s time to break camp, pack up, and head off, the Platypus comes with a storage sack to make efficient packing and carrying incredibly simple. 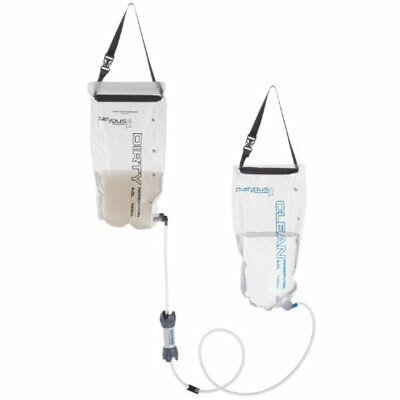 This gravity-fed system water filtration system uses two bags with 0.02 micron absolute filter for backcountry camping and emergency preparedness. Suitable for a family or small group of people, the Sawyer Two Bag Complete Water Purifier System comes as a kit with every component needed to start cleaning water. Providing the ability to filter up to 170 gallons of water per day, utilizes what Sawyer calls a Point Zero Two filtrtion system at the core of its water purification capability. Removing 99.997% of viruses as well as 99.99999% of bacteria and 99.9999% of protozoa/cysts, the Sawyer Two Bag Water Purifier System is the perfect collapsible water filtration setup if you’re looking to ensure safe and clean drinking water wherever you are. If you find yourself in an emergency situation that finds you away from home, the ability to access clean and safe drinking water becomes more important than ever as you won’t be able to fall back on a stored supply of bottled water or other home preparedness hydration solutions. With this in mind, your survival gear should always look to incorporate at least one element of portable survival water filtration and ideally factor in redundancies on top of this. This way, wherever you find yourself, you’ll know that a questionable water source is safe to drink. 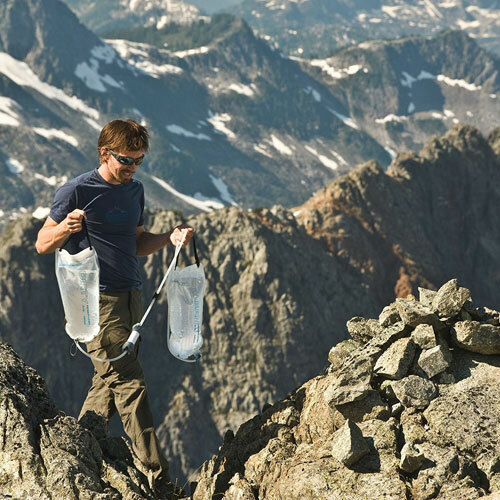 The priority for a portable survival water filter should always be on striking balance between size (and the ability to pack or carry easily given your specific requirements) and the ability to effectively purify as many potentially harmful elements out of your drinking water as possible. These factors make the overall weight and size of the solution an important consideration but also put an emphasis on the ability of the solution you choose to filter raw water sources quickly, reliably, and effectively, no matter where you are. 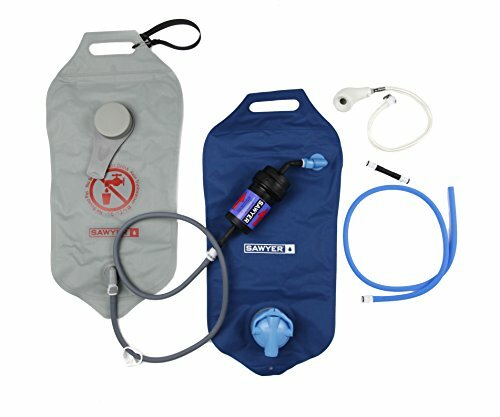 Whether you’re travelling on foot, in a vehicle, or are preparing a ‘get home’ kit for use at work, there are a number of highly reliable and ultra portable survival water filters that are perfectly designed to fit in a bag, glove compartment, large pocket, or desk drawer to be called on if and when needed. 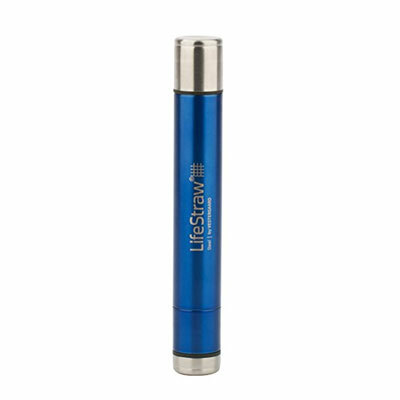 The LifeStraw Steel gets our vote here as it represents that perfect combination of rugged durability alongside high performance and reliability that are so crucial in a survival situation. 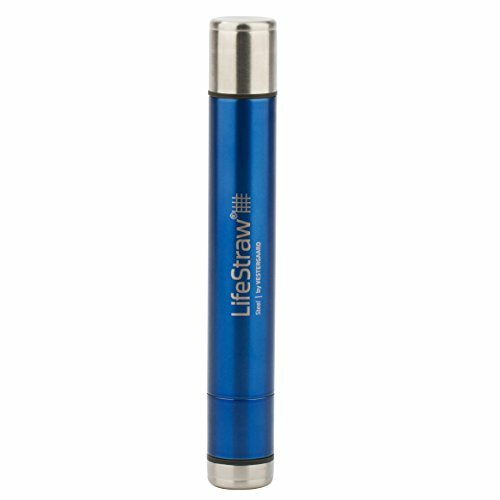 Small enough to grab and go when needed, the LifeStraw Steel uses a replaceable carbon filtering capsule that provides 2 stage filtration and allows purification of up to 1000 liters of water. The best survival water filters need to be reliable at all times and the LifeStraw Steel removes at least 99.9999% of waterborne bacteria as well as 99.9% of waterborne protozoan parasites from a water source. 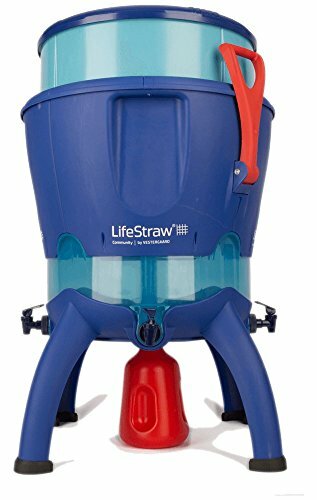 On top of this, the LifeStraw’s 2-stage filtration system aims to remove as much residual taste and odor from water as possible which can represent a significant benefit when using in the field. 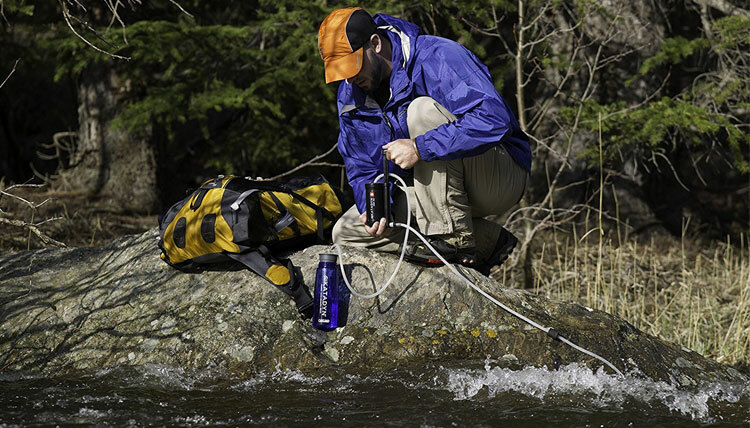 With a total weight of 4.2 ounces, the LifeStraw Steel is light enough to slip in a backpack as a quick-grab survival water filter while it’s highly durable (and food-safe) stainless steel design make it well suited to any number of emergency situations or prolonged use outdoors. 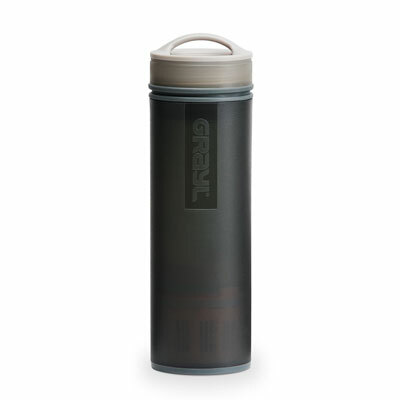 The Select S3 is part bottle style water filter, part general purpose portable water filter (for a ‘traditional’ water bottle style filter from the brand, see next section), but in both instances, the S3 is a powerful survival water filter that takes up minimal packing and carrying space yet delivers maximum filtering results. Providing the ability to purify a water source of viruses, chemicals, bacteria, heavy metals, protozoa, and pesticides in just 10 seconds, the Select S3 does this all while still remaining compact enough to pack in a bag for use in the backcountry. The filtering creds at the heart of the Select S3 are delivered from a combination of an innovative foam membrane and 0.1 micron filter that bring a source of raw water down to purity levels below EPA standards for safe and clean drinking water. In practice what this looks like is a 99.99999% removal of bacteria, 99.99% removal of viruses, chemicals reduce to 0.5 parts per billion, and pesticides removed to 0.1 parts per billion. The container of the Select S3 is a durable silicon bottle that provides a 20 ounce water output which can be used either to ensure access to clean drinking water on the go or for filtering water for other uses when you’ve made camp or in your home during an emergency. One of the unique features of the MUV Survivalist water filter is the inclusion of three different filters which allow for a high level of flexibility when it comes to choosing the level of filtration required. The three filter elements included (known as the MUV1, MUV2, and MUV3) allow the unit to filter at different levels of intensity, offering a carbon fiber membrane, hollow-fiber membrane, and electrostatic filter respectively. Simply the stack the various filters inside the main unit itself to achieve the desired level of filtering ability. Ideally suited for use either in a bug our vehicle or bag configuration, as well as for keeping at home as part of your emergency preparedness and contingency supplies, the MUV Survivalist water filter system can be operated as either a straw filter, a gravity system, or attached to a water bottle for portable filtration. Offering the benefit of being able to fill up and carry a source of water which is then purified and filtered as you drink it is a major advantage in a survival situation and this is exactly what canteen and bottle survival water filters allow. With a a water bottle survival filter you can quite literally fill your bottle up from a water source and drink as normal, with the filter element taking care of the impurities as you drink, leaving you with a reliable, clean, and safe source of drinking water wherever you are. 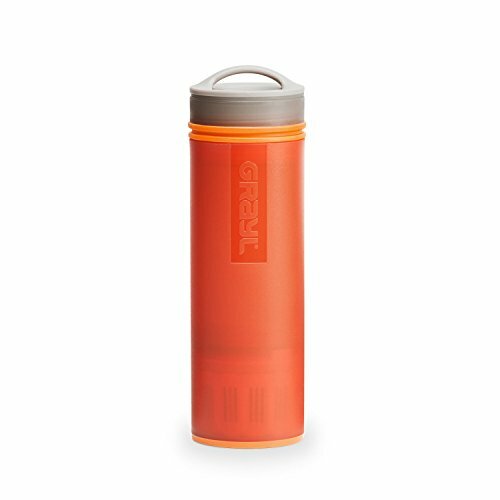 The GRAYL Ultralight Water Purifier is a survival and backpacking water bottle filter with a unique ‘one press’ approach to filtration and purification. Utilizing your body weight to quickly filter raw water through the system, the GRAYL produces 16oz (around 500ml) of clean and safe drinking water in 15 seconds. What this means in action is you’re only going to need to fill your bottle at a stream or similar water source, wait 15 seconds to purify your water, before you’ll be able to hit the trail or road again. Each GRAYL bottle includes a replaceable purifier cartridge which is good for about 40 gallons/150 liters of survival water filtration, ensuring you have enough clean and safe drinking water for a period of up to 2-3 months. The replaceable filters in the GRAYL combine 3 layers of filtration – a non-woven ceramic fiber filter, a positive ion ‘mesh’, and activated carbon – to purify a raw source of water, removing bacteria, protozoa, and chemicals as well as residual taste and odor. Build replacement filters into your home preparedness pantry and this portable survival water filter becomes one of the best ways to keep a water filtration redundancy on hand for disasters that you can easily slip into a backpack if you need to bail out in a hurry. 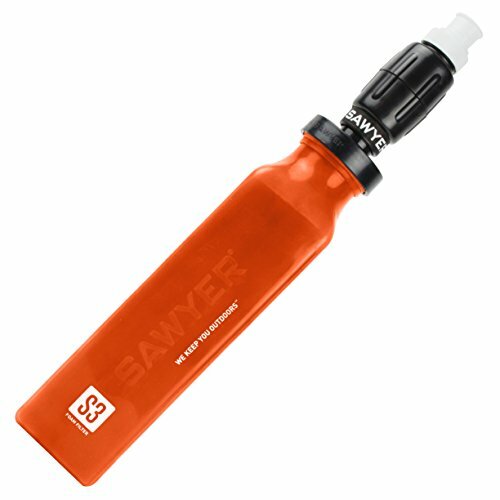 The Personal Water Bottle Filter from Sawyer is a great solution if you’re looking for a ‘go-anywhere’ survival water filter solution that can be thrown in a bag with pure water and refilled from a more questionable source if needed. Built around a 0.1 Micron absolute hollow fiber membrane inline filter, this bottle filter solution is able to remove 99.99999% of all bacteria including salmonella, cholera and E.coli, as well as 99.9999% of all protozoa such as giardia and cryptosporidium. The 34 ounce water bottle features a BPA-free construction and comes with two filtering ‘straws’ for replacement when needed. 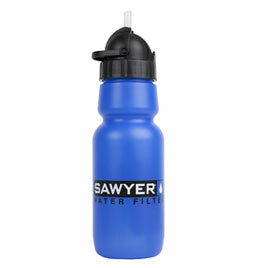 Added versatility of this filtering solution comes in the fact that you can use the included filter inline with a hydration pack’s tubing, while the bottle cap itself is designed to fit standard 63mm wide mouth water bottles, meaning you can easily swap it out to work any other compatible bottle. 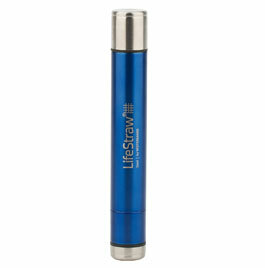 The LifeStraw Go is formed of two components for collecting, carrying, purifying, and drinking water on the go. A 23 ounze BPA-free Tritan water bottle makes up the water carrying capacity of the Go and a leak-free design means it can be easily filled from a water source and carried in a bag or backpack without worry. 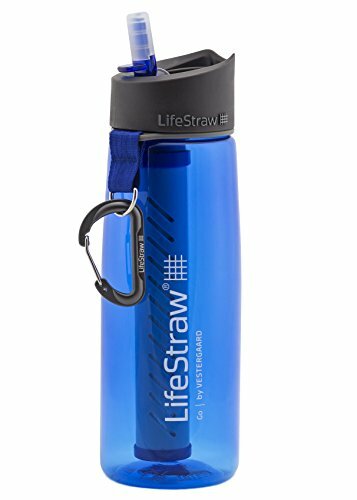 Filtration is handled by a LifeStraw hollow fiber membrane water filter between the bottle and the mouthpiece which is capable of removing dangers such as bacteria and protozoa from water, allowing you to collect from sources such as lakes, ponds and streams to ensure safe, clean drinking water. 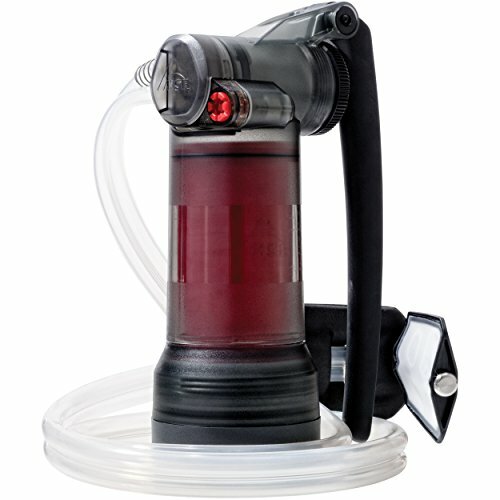 While the survival water filter within the Go is designed to remove 99.9999% of waterborne bacteria and 99.9% of waterborne protozoan parasites without the use of chemicals, iodine or additional power, the same 2-stage activated carbon filter is also able to reduce odors and aftertaste while before drinking. The inconspicuous design and portable packing profile of the LifeStraw Go also makes it an excellent solution if you’re travelling to a foreign country where the safety of drinking quality is questionable and requires an added layer of purification before safely drinking. Using a pressurized system powered by a hand pump, the LifeSaver water filter bottle effectively works by ‘pushing’ raw water through the in-built filtration system in order to completely remove any harmful contaminants or particulate, leaving you with clean and safe drinking water. The inclusion of a carbon filter within the bottle effectively removes odor and taste leaving you with drinking water which is both safe and tastes great while also taking care of chemicals and heavy metals. When the primary filter reaches the end of its effective life it automatically shuts down to make sure that you don’t consume unclean water. This survival water filter bottle is a great option for slipping into the trunk of your vehicle, keeping at home with your food and water preparedness supplies, or packing in a bug out bag for use when needed. 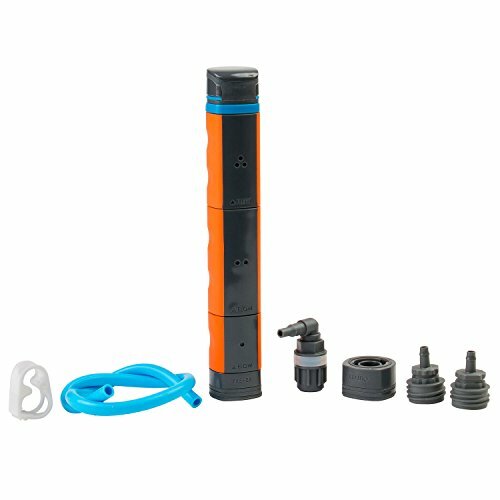 The best microfilter systems offer a lightweight, pump-action system for purifying water on the go, allowing you to filter and fill any water carrier or bottle you have with you. Utilizing a pressure based system (usually through a hand pump) to extract water from a source and pull it through a filter or series of filters, generally means you’re going to benefit from a faster filtration flow rate when it comes to drawing water from any source. With this in mind, microfilter systems are an excellent survival water filter option when combined with a standard bottle or hydration bladder (or multiples) into which you can decant filtered water when stopping by a source. While inevitably taking up more space in a backpack or bag than other portable water filter systems, microfilters are often designed to be as small and lightweight as possible to mitigate these effects. This 11 ounce microfilter is designed for carrying in a backpack as a dedicated survival filter for ensuring you’re able to filter water direct from a raw water source such as a river or lake. Pair with a standard hydration bladder, water bottle, or canteen, and a few pumps of this microfilter at a water source will allow you to decant clean and filtered drinking water from source to whatever carrying medium you prefer before setting off again. A clear advantage of this microfilter system is a large filter surface which effectively means you’re going to be able to increase the output rate of filtered water through the system while removing all of the impurities which would otherwise make certain water supplies completely undrinkable. The Hiker Pro Microfilter removes bacteria, viruses, cysts, and algae while the activated carbon within the core of the filter serves to also reduce the presence of tastes and odors in any water that you pull through the system. Whether you’re looking for a survival water filter for emergency preparedness, backcountry use, or travel, the MSR Guardian is designed to a wide range of water purification scenarios. This military grade microfilter system pumps at 2.5 liters per minute allowing you to treat up to 10,000 liters of water in even the harshest of environments. The rugged durability of this survival water filter means that not only will it perform at all times, but is able to withstand freezing, drops, and continued heavy use. In terms of water filtering credentials, the Guardian meets NSF protocol P248 testing standard used by the U.S. military and utilizes medical-grade fibers to provide protection from waterborne threats such as viruses, bacteria, protozoa, and other particulate. Finding a high performance survival water filter that’s suited to the challenging requirements of backcountry use or a bug out situation can be a tall order, however the 17.3 ounce weight of the MSR Guardian makes the system a highly attractive option for carrying in a backpack as a dependable source of emergency water purification. 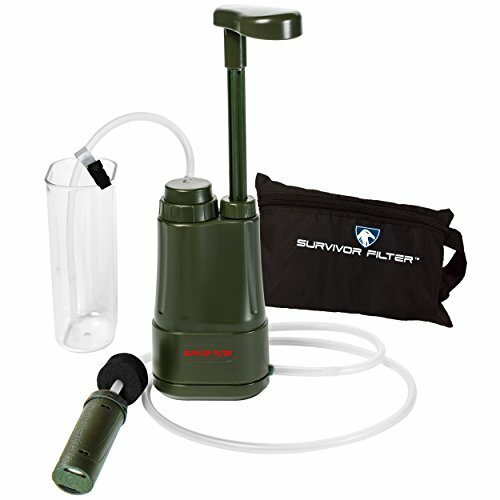 According to the brand, the Survivor Filter PRO survival water filter has been shown to remove 99.9% of virus, staph, and bacteria from water sources in independently conducted tests. On top of this, the tests showed a significant reduction of Heavy Metals from water including 99.5% of Mercury and 93% Lead, surpassing EPA standards for water filters. 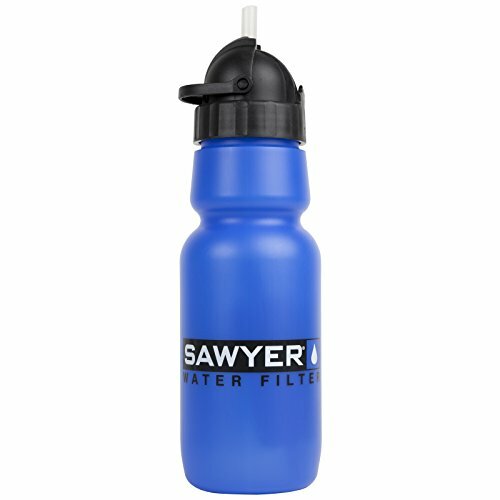 Utilizing a 0.01 micron ‘Ultra Filter’ and carbon filtration, the Survivor Filter Pro is able to filter 17 ounces / 500 ml of water per minute, leaving you with a safe and drinkable end result. The Ultra Filters are replaceable and are good through the filtering of around 100,000 liters before they need to be replaced. Similarly, the carbon filter is good for up to 2000 liters of use before it will need replacing, and is primarily used for the filtering of heavy metals, heavy metals, odors, and residual taste in the water. 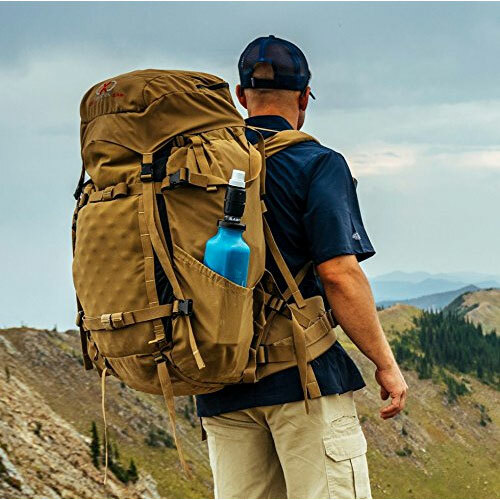 With the actual body of the Survivor Filter PRO constructed from BPA free, military grade ABS and measuring just 6.5 inches in length, this is one of the top survival water filters for carrying in a backpack, stowing in the trunk. or keeping alongside your home emergency preparedness supplies. With all of our rundowns and reviews, we reference as many expert sources, and real world user reviews as possible so we’re able to provide the most relevant and educational information on the ins and outs of the best survival water filters. Finding the best survival water filter for your specific situation is ultimately a highly personal activity with individual needs and preferences sometimes varying considerably between people, locations, and uses. With these considerations in mind, this guide looks to provide advice on our own opinions of the best survival water filters available today, however, it’s always important to carry out your own due diligence to find the best solution for you when picking a water filtration system that’s perfect for your situation.